It seems that we have past the top of the hype around Platform-as-a-Service. A good moment to assess how serious the adoption of PaaS is in the enterprise. Foundational PaaS: the layer on which we stop talking about infrastructure and switch to an app-centric view of the world. We move from servers to containers, from software-defined networking to orchestration and routing, and from block storage to object storage. PaaS: platforms that take code as input and run it as an app (aPaaS), platforms that take integration flows as input and execute them (iPaaS), or platforms that store and query your data (dbPaaS). Model-Driven PaaS: platforms that take models as input and execute them. Also called RAD platforms, High-Productivity aPaaS (Gartner) or low-code platforms (Forrester). If you look at these different PaaS types you would think that Model-Driven PaaS follows PaaS adoption. That Model-Driven PaaS is more of a niche market. In the enterprise world, the opposite is true. 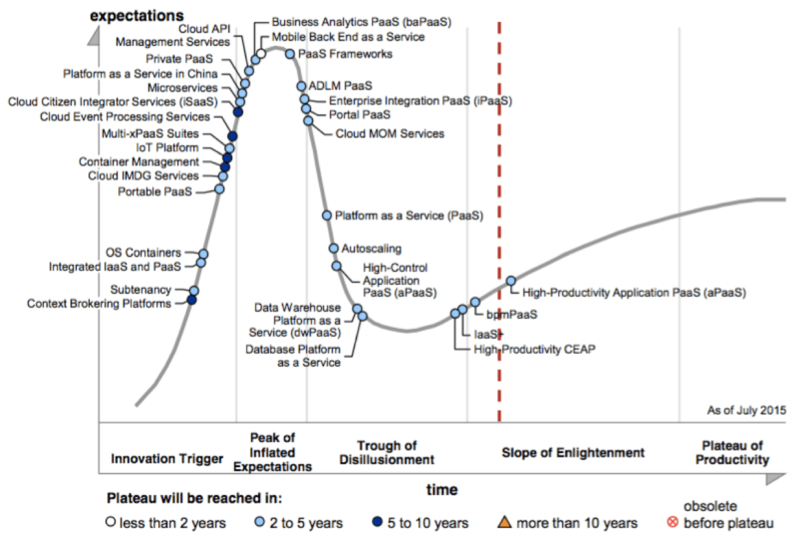 The most interesting part of this hype cycle is the position of “High-Control PaaS” versus the position of “High-Productivity PaaS”. Or in other words: “PaaS for traditional programming languages” versus “Model-Driven PaaS”. Why is Model-Driven PaaS perceived as more mature than other approaches? The simple reason for Model-Driven PaaS being perceived as more mature is that it is delivering business value quicker. I wrote before that PaaS is lacking a vision on application development. The driver for PaaS adoption is the need to be able to innovate. Companies need digital innovation to survive. Hence, they need to become software companies. They need to become more productive and agile in their software delivery. PaaS is part of the answer: it makes application deployment and operations faster, self-service, and way more efficient. However, the other half of the answer is Model-Driven Development. We should move from software-defined to metadata-driven. It is exciting to see that the use of models to drive application development is no longer something just for the early believers! On a daily basis I see companies that are asking for the higher productivity of model-driven approaches. And this is not just anecdotal. Forrester expects the “low-code platform market” to grow from $1.7B in 2015 to over $15B in 2020 . Enterprises see the need for digital innovation. They are changing the way they deliver software. They are creating smaller, cross-functional teams and focus on shorter feedback cycles. And their platform of choice is low-code, model-driven, and highly productive. Very interesting assessment of where things are going with PaaS and leveraging the benefits or models. I was a little surprised to see the market growth projects at almost 10 times in 5 years. Though as you suggest, where there is potential for improved innovation and faster development turnaround, there will be plenty of demand. Thanks.